Located in San Francisco, Green Cure Delivery has been serving faithfully its clients since 2015. Patients have always been the collective's number one priority, therefore, the company does its utmost to provide them with top-of-the-line medication. As for products like oils, suppositories or tinctures, the company manufactures all of the above itself. So Green Cure can make a cannabis product of a patient�s choice from the combination of different strains that are to their liking. The collective takes pride in its comprehensive service � it thoroughly monitors every stage of production in order to guarantee the best possible quality of finished products. Moreover, the friendly staff here is always available for queries on the matter of choosing the strain appropriate for your needs. 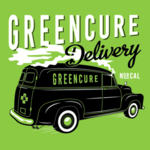 Green Cure Delivery does its best to deliver orders in a timely manner � most shipment takes less than 45 minutes. Well of course since it is based in SF, during rush hours it might take longer. The firm delivers to San Francisco and Daly City, including many districts, from Castro to Fisherman's Wharf.